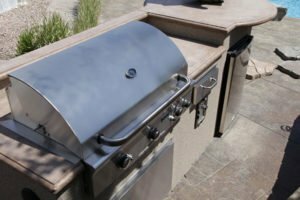 Find out how a custom-built outdoor kitchen from Aqua-Tech will change your life! After the long Winnipeg winter, we all want to maximize the amount of time we spend outside in the summer. One fantastic way to do just that is by installing an outdoor kitchen from Aqua-Tech. When you choose Aqua-Tech to design and build a custom outdoor kitchen, you’ll be getting a talented and skilled in-house team of experts to craft an beautiful and valuable addition to your home, and one of the best ways to spend more time in your backyard paradise. Your new outdoor kitchen will be designed for you and crafted to address your requirements and needs. Imagine being able to have a pool party, prepare delicious food and mingle with your friends at the same time, or watch over the kids as they’re splashing around while you’re getting dinner ready. However your Aqua-Tech outdoor kitchen is designed, one thing is certain: you will not be disappointed with the final result. By incorporating a gourmet, chef’s quality outdoor kitchen into your backyard design, you’ll never have to be separated from your guests or family while you’re cooking. A customized Aqua-Tech kitchen can include any number of premium features, such as a barbecue, fridge, burners, warming drawers and anything else that you’d need to satisfy your culinary requirements. Whichever elements you include, our premium outdoor kitchen products will bring your dreams to life. Joe, when you said you could design anything I thought I had heard it before. You hit it out of the park with the custom outdoor kitchen you designed for our family. It is going to be a pleasure pouring that draft beer at our parties. 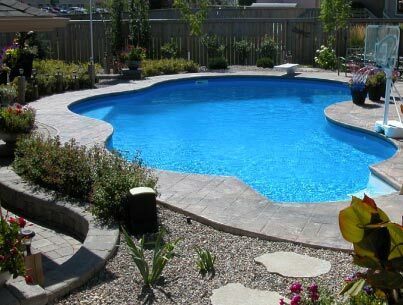 Aqua-Tech’s skilled team can design and install your tailored outdoor kitchen to provide a beautiful and consistent addition to your existing home or backyard architecture and swimming pool. Whether you include an outdoor kitchen as part of your swimming pool installation, a renovation project or on its own, you’re guaranteed that the final result will be a seamless extension of your home, and an outdoor living room that your family will love to use for decades. Are you ready to bring your backyard dreams to life? Fall in love with an Aqua-Tech outdoor kitchen. Start creating yours today—call now!